The Objective Box is, well, exactly what the name suggests! It is an objective box based on an App created by Tye Campbell for Campbell Innovations LLC and is distributed by the S.W.A.T group of companies (who are also the creators of the S.W.A.T VTG or Versatile Training Grenade, a blank firing timed grenade used in Airsoft). 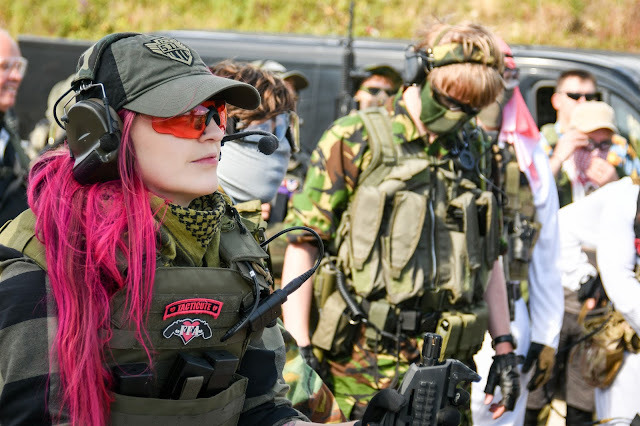 It is the first completely customizable game objective platform for Airsoft and Paintball use in the UK and was released in October of 2014. The app is available for purchase through iTunes for the very reasonable price of £7.99 and the physical box itself is built by the user via instructions on the construction part of their website – the app can be used with or without the box, but building the objective box definitely enhances the users gameplay experience. Let’s talk about the app itself and its game modes! The app has three basic game modes: Timed Mission, Capture Mission and Rush Mission. standard Team Death match, Free For All and defensive missions but also something a little different which I have never heard of before: ‘Wake Island’ which entails a large group of players to defend an area or objective for a duration of time, the attacking team has to eliminate all of the defending players. In this game the attackers respawn in a designated area but, the game has a nice little twist in the fact that once the defenders are hit, they defect onto the attacking team – the aim of the game is to have enough attackers to overcome the defending team and the game is won by either the defenders withstanding the attacks for the duration of the time set or the attackers successfully eliminating all of the defending players. The Capture Mission Game Mode does exactly what it says – two game types based on capturing the objective box itself. One, capture the flag requires the box to be set in a neutral location and the first team to capture the box and bring it to their teams starting point is the winner. The second game in this category is the objective box capture, which is by far my favourite game mode! This game consists of the objective box being placed in a central, neutral location between the two teams – the teams must arm the box – by placing their finger on the iPod/iPhone/iPad, and defend the box until the sirens and flashing lights die out and the box declares ‘Objective box destroyed’ – the sound effects really make this game! Rush is the third and final game mode the Objective Box App is capable of, I’ve never personally played this game mode but feedback from other players at the site suggest it’s definitely one of the more popular game modes. Rush can be played with one objective box but gameplay is more intense when there are multiple boxes for the players to arm and defend. The aim of this game is for the attacking team to find, arm and detonate all the boxes – this can either be played as a fast paced skirmish or as an operation spread over a few hours. The physical Objective box itself is built by the user following instructions on the construction part of the Objective Box UK website, as previously stated. They are relatively simple to build and improve the users game play experience exponentially! The boxes are built on a base of a large toolbox that has speakers and flashing lights installed that are utilised by the app during gameplay. The sound effects that emanate from the box include sirens, count down music and pre-recorded phrases such as ‘Objective box armed’, ‘Objective box disarmed’ and the phrase the attacking teams love hearing ‘Objective box destroyed’ which all add to the atmosphere of urgency and menace. The user interface of the app is very simple and easy to use – is available in different languages such as English, French, German, Simplified Chinese and Spanish so it can be utilised in different countries around the globe. The app has the capability to allow users to completely customise their games to their needs with ease from mission delay time, overall mission time, medic rules and respawn rules, arm/disarm button press time and even includes an in game lock out feature with a passcode to ensure a fair and honest arm/disarm. 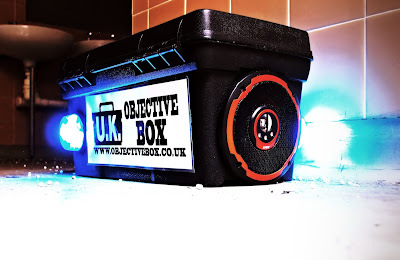 During my game days at S.W.A.T Fortress, the objective boxes have been used during each game day as they are really popular amongst the players as an addition to the games and for someone like myself who prefers objective based mission games over your standard Team Deathmatches and Free For Alls, they are a welcome addition to the Airsoft industry! 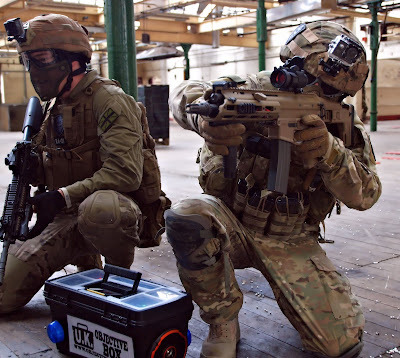 I have seen similar devices used but none of them quite stand up to the quality and standard of these objective boxes used at S.W.A.T, I’d really love to see these at more sites around the UK so other players can experience this type of game play. I’m also really interested to see how these Objective Boxes will influence other tech advances in the industry. Compatible with: iOS 6.1 or later. iPhone, iPad and iPod touch. The app is optimised for iPhone 5. Hardwick, K. (2015). 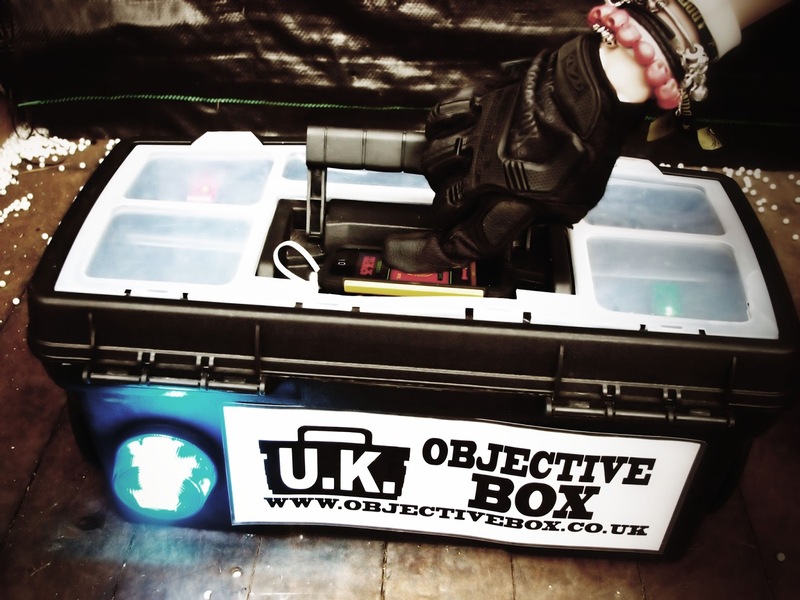 The Use of Technlogy in Airsoft: Objective Boxes. Airsoft Action. November (54), 38-39.